The University Library offers various options for accessing digitised works. An order can be placed for the digitisation of copyright-free books from the collection of the University Library, provided that the author died at least 70 years ago or the University holds the publication rights for the book. Multi-discipline digitised media from the cultural assets in Mecklenburg-Vorpommern are brought together in the Digital Library Mecklenburg-Vorpommern. Participants include archives, museums and libraries of the federal state. The collections of the libraries and museums also offer a PDF version of the digital media for downloading. Anyone wishing to further process the content of the archives must apply for permission to do so from the archive that owns the material. 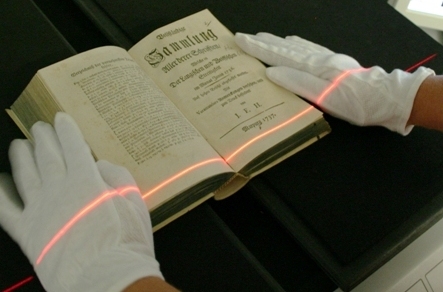 Since 2009 the University Library of Greifswald has been scanning books from its textbook collection and makes the digitised objects available to students and members of the university. You can view the full texts for your own academic purposes at the electronic reading stations in the library. The digitised material can be accessed via OPAC: There is a link to the full text in the search results for the printed copies. Clicking on this will switch you to the MyBib e-Room. You can call up individual chapters here using the navigation bar or scroll through the pages. Unfortunately, printing or downloading is currently not possible for legal reasons. Users can use a form to make proposals for the digitisation of copyright-free literature or books from the textbook collection. Should academic members of the staff require digitised media from copyright-free literature for their seminars, they should contact the subject librarians responsible with a literature list. The requests will be checked for feasibility and then processed by those responsible for digitisation.